Deep in the Eifel mountains of northwest Germany exists the toughest, most dangerous, and most demanding race track in the world, the Nürburgring. With a total length of 25.947 km (16.123 mi), this 170 turn circuit was nicknamed “The Green Hell” by former Formula 1 driver Jackie Stewart. Today the track is home to the German Grand Prix and other various motorsports events like the 24 Hours Nürburgring. The circuit was built back in the 1920s around the castle and village of Nürburg. When it was completed, the track itself was an amazing 28.265 km (17.563 mi) long and contained 187 extremely dangerous turns. Since then, track modifications have shortened the length of the circuit and also made it safer for today’s race cars. Remnants of the unused older circuit were converted into public road in the 1980’s and lead through the town of Hullenbach. The rest of the original track exists today in what is known as the Nordschleife. This contains a staggering 20.81 km (12.93 mi) long section of the original track that’s considered too dangerous to host most professional racing due to it’s sharp elevation changes and blind corners. Other concerns come down to inadequate safety coverage of the remote sections of the track, and also it’s just very difficult for a driver to memorize the profile of that many corners. Even so, the Nordschleife is still used for some weekend racing series today, but most of the premiere series (like Formula 1) use the newer, and safer, Grand Prix configuration built in 1984. 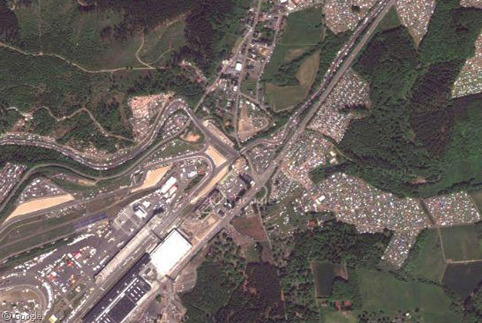 The Nürburgring has become somewhat of a legend by racing enthusiasts around the world. The Nordschleife section is covered in graffiti from fans either expressing their love for the circuit, or just trying to leave their mark in history on the track itself. The graffiti is even visible on Google’s grainy satellite pictures. Some of the most interesting features of the Nordschleife circuit include the Karussell, a blind corner that contains a banked concrete groove that’s only wide enough for one car at a time, and Flugplatz (“Airport”), where cars easily become airborne due to the sharp crest in the road. Inside the Nordschleife you will find the medieval castle of Nürburg. This structure was built back in the 13th century, and it remains one of the iconic symbols of the Nürburgring. If you’re brave enough to try to take a lap around the Nordschleife circuit, just pay the €22 lap fee and the track is yours. The Nordschleife has actually doubled as a one-way public toll road for over 80 years but be careful, drivers are responsible for all track repairs and downtime caused by accidents, not to mention an average of 7 people a year are killed here in track related incidents. For more information on the Nürburgring, visit their website or of course Wikipedia. You’ve probably noticed the enormous oil leak near the Gulf of Mexico. Do you think it will have a significant damaging impact on our animal population around Mexico? It’s probably worth doing a quick skim for umlauts – the correct spelling is Nürburgring for the Ring and Nürburg for the castle/village (or Nuerburg if you can’t find the right key).